Happy Wednesday ladies and gentleman. How is everyone doing? 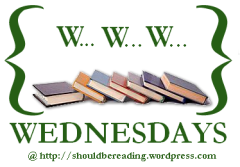 It's that time of the week again to let everyone know what I've been up to reading wise. I'm actually reading two books at the moment, which is rare for me because I like to concentrate on one book at a time. Currently I'm reading Antigoddess by Kendare Blake. This book just sucked me in and I love the mythology of the greek gods. I am also re-reading The Raven Boys by Maggie Stiefvater. I wanted to read it again before I read The Dream Thieves. I just finished reading Deception by C.J Redwine. It was a good sequel to Defiance. I really want to read The Dream Thieves by Maggie Stiefvater, hopefully my book gets delivered this week. Also up next is I Hunt Killers by Barry Lyga. The Raven Boys is a great book to start with. Thanks for stopping by Chrissi. I can't wait for The Dream Thieves. Thanks for stopping by Gwynn. I haven't heard of those - enjoy! My list is at http://katybrandes.wordpress.com/2013/09/18/www-wednesday-sept-18/. Really enjoying Antigoddess. The reinterpretation is interesting and I love the humour in this book. Thanks for stopping by.